SportCount Band Extender attaches to any SportCount to extend the band so that it can fully wrap around handlebars on a bike, motorcycle, or whatever. It is designed to help cushion and prevent rotation around the handle bars. The Chrono 200 is SportCounts top of the line model. It is now 20% thinner and lighter with a more legible display than the Chrono 100. It is the best choice for coaches, serious athletes, and racers who need to record multiple lap times. Great for marathon runners, triathletes, and for those who want to monitor races or workouts lap by lap. It also has a PAUSE feature, so you can interrupt your workout without throwing off your timing statistics. 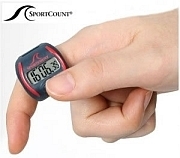 The New Sportcount LCT (#90010) combines lap counting and timing functionality. It is a great all-purpose training and exercise device, perfect for swimmers and joggers. It provides lap count and split times during your workout, and reports summary statistics at the end of the session. Sport Count Velo-X (#90005) is the latest addition to the SportCount family. This product is designed to work in on a bicycle, dirt bike, or motorcycle. Velo-X includes a specially designed band which allows it to securely attach to any set of handlebars while cushioning the electronics from bumps and vibration. The LapCounter (#90040) can be used by athletes or by anyone needing to count anything: pool laps, track laps, attendance, inventory, customers coming into a store or a theater, microbes under a microscope, etc. One hand operation makes counting easy and leaves your hands free to do other things.